has been the President of the Applied Science University since November 2014. He was named as one of the top ten academic leaders shaping executive education in the Middle East by the Middle East Economic Digest. He spent five years in the Department of Civil and Building Engineering of Loughborough University (sponsored by Hariri Foundation), where he obtained his MSc in Construction (1987) and his PhD entitled Integrated Planning Systems for the Construction Industry (1991). In 1992, Professor Aouad joined the University of Salford as a Research Fellow and progressed through to the role of Pro Vice Chancellor for Research and Innovation and Dean of the College of Science & Technology before he left in December 2011. During that time, he successfully supervised 24 PhD students, externally examined 52 PhD students, authored 3 major research books and co-authored one book, generated more than £10M in research funding as Principal Investigator and £8M as Co-Investigator, published 92 papers in top rated refereed journals, delivered more than 50 keynote speeches and invited lectures, and presented his work in more than 42 countries. In January 2012, he became President of the University of Wollongong in Dubai (UOWD) where he led the development of the Strategic Plan 2013-2018 and the preparation of the documentation for the institution licensure renewal and the University achieved during his time an increase of 13% in student recruitment. In May 2013, he became Vice President for Academic Affairs at Gulf University for Science & Technology (GUST) based in Kuwait. 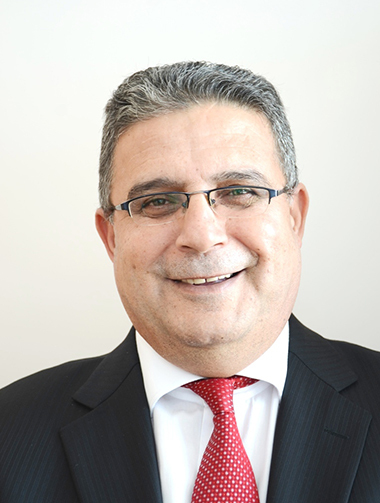 Furthermore, Prof Aouad was appointed as Vice President of the Chartered Institute of Building (CIOB) in March 2010 and became President in June 2014 for a year. He is the first ever president with a Middle Eastern background. The Chartered Institute of Building is the world’s largest and most influential professional body for construction management and leadership established in 1834 with a membership of 45,000 from across the globe. Prof Aouad sat on the REF (Research Excellence Framework) sub-panel 16: Architecture, Built Environment and Planning. REF is in charge of assessing national research in the UK. In July 2016, Professor Aouad received an honorary doctorate of technology from Loughborough University in the UK.